Newly, Delphi Eid ul Azha collection 2014 for women has been launched inside the fashion market. This collection has been launched as in favor of the coming Eid ul Azha 2014 occasion. Delphi is one of the most famous and hence one of the leading well known fashion houses of Pakistan. This fashion house has been all involved in offering with the clothing collections for the women since the last few couple of years. This brand has earned the heights of fame and attention in just the beginning of its establishment by the way of offering with the classy and amazing clothing collections for the seasonal and occassional wear. 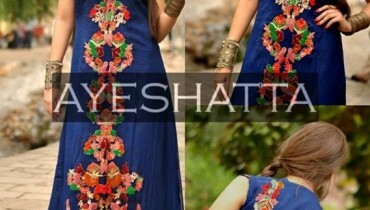 In this Eid ul Azha 2014 women will be finding some of the fashionable looking dresses designs that have been all set within the designing of the traditional versions. Eid ul Azha collection have been added with the stylish long shirts along with pairing of trousers and churidar pajamas. All the dresses in this collection have been finished with the styling according to the latest and newest fashion trends. Dresses have been made additionally stunning with the use of embroidery and lace work. Colors have been set in the light and soft color combinations that is ending up the whole collection so colorful and full of life. In this post we would like to share the images from the photoshoot of Delphi Eid ul Azha collection 2014 for women. Collection shoot has been covered by Ayaz Khan and makeup and styling is all done by Raana Khan. Featured model in the shoot is Amna Ilyas. Hence this whole Eid ul Azha collection by Delphi is designed in complete modern and elegant versions. Go and be the first to catch this classy collection!